Mumbai: The September quarter earnings of Indian manufacturing firms showed the best growth in at least the past 12 quarters, but with raw material prices rising and the Reserve Bank of India, or RBI, indicating that the days of easy money are over, companies will need to do more to make the numbers look good—they really need to drive up sales. For 317 manufacturing firms that form part of the Bombay Stock Exchange’s BSE 500 index, the growth in net profit in the September quarter stood at 54.45%. Had there been no change in raw material prices and interest costs from the year earlier—when the credit crunch took hold, giving rise to stimulus measures—this would have been just 8.3%. Banks, oil marketing firms and service sector companies are not included in this analysis. Oil and gas firms’ earnings depend on volatile international crude prices and a subsidy sharing mechanism by the government. Banks and financial institutions have a different earnings model as money is such firms’ raw material. Here’s how we arrived at the figure: Raw material costs as a percentage of net sales fell to 42.52% for the three months ended September, compared with 45.13% in the year-ago quarter. Similarly, interest costs as a portion of net sales fell to 1.79% versus 1.96% a year ago. If these costs had remained in the same proportion to sales, the collective net profit of these firms would have been Rs31,406 crore instead of the reported Rs44,793 crore. In other words, the profit growth would have been reduced drastically to 8.3%. “Margin expansion", or the impact of cost cuts, was one of the main reasons for the good profit growth in the second quarter, said Rajgarhia of Motilal Oswal. Prices of raw materials such as steel, aluminium and rubber declined sharply earlier this year due to the slump in global demand following the credit market seizure as markets crashed and US investment bank Lehman Brothers Holdings Inc. collapsed in September 2008. Most companies in the manufacturing sector benefited from the worldwide price reductions. Indeed, on an absolute basis, raw material costs fell 16.54% in the three months ended September, the second sharpest decline in at least 15 quarters. The steepest fall of 22.79% was reported for the three months ended June 2009. Second-quarter earnings “surpassed our expectations on operating profits and margins because of lesser-?than-expected operating costs," wrote Dhananjay Sinha and Komal Taparia of Centrum Broking Pvt. Ltd in an 18 November note. On the interest rate front, too, companies benefited from the easy money policy of RBI, which cut rates and banks’ cash reserve requirement, or the portion of deposits kept with the central bank, several times to ease the credit crisis. Even though loan growth hasn’t really picked up in the economy, the liquidity infusion and rate cuts along with debt restructuring by companies have led to a smaller interest outgo for many firms. Interest costs in the September quarter fell 19.35%, the first time in 10 quarters when this metric recorded a decline. While analysts and economists are convinced that growth remains on track, they say that these factors can’t be relied on to sustain the earnings momentum. For one, the central bank will reverse its easy money stance as inflation is rising. In its October review of monetary policy, RBI withdrew some of the special liquidity measures introduced last year and imposed tighter norms for realty sector lending. Most economists expect RBI to raise rates as early as January as wholesale price inflation may rise to as much as 8% by March from the current level of 1.5%. Higher interest rates and the draining of liquidity are the two conventional tools to fight rising inflation. Secondly, commodity prices have risen from their lows this January. For instance, aluminium prices have increased 31% to $2,060 per tonne (Rs95,996). 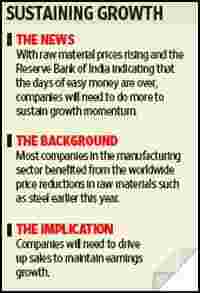 Prices of steel have also gained 5% while crude prices have risen by 65% to $76.72 a barrel. “The effect of these factors will level off from Q4 (the fourth quarter)," said Apurva Shah, head of research at domestic brokerage Prabhudas Lilladher Pvt. Ltd. Even if raw material prices increase, they won’t immediately reflect on costs for listed companies, most of which are big finished goods manufacturers. “Intermediate pricing (such as for auto parts) remains low," said Shah. “These companies are not in a position now to pass on raw material cost increases since everyone is sitting on spare capacity." Once demand revives, intermediate pricing, too, will improve and then companies will have to depend on revenue growth.